12191 S. FACTORY OUTLET DR. The day before I left for Salt Lake, I was thinking to myself how bummed I was that I was going so close In-N-Out, but out of range. 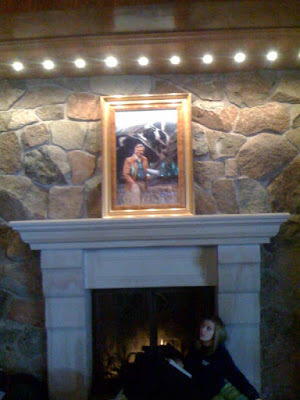 The last time I was there, the nearest one was in St. George. Unless you are passing through, there is no reason to go to St. George. In a fog of self-pity, I went on their website, just to think about the many good times we have shared in the past. 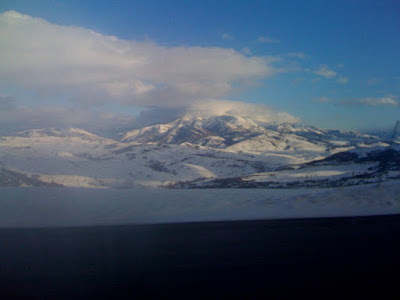 When I punched in Salt Lake City, however, an address popped up. I nearly jumped up with excitement. Luckily I didn't, because Federal Income Tax was about to start, and NO ONE is excited when that time rolls around and my cover would have been blown. 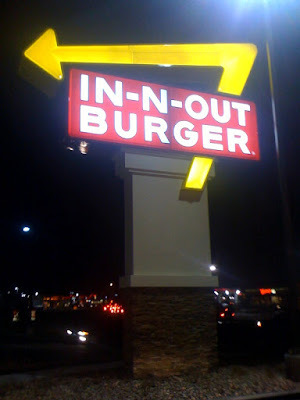 So after realizing that the website is NOT compatible with the I-phone software, we embarked on a mission to find the Draper location of this mythical burger chain. All you need to know, is the sign is visible from I-15, and it's around 12300 South. You will see it's sign beckoning like a lighthouse in a monsoon of strip mall mediocrity. 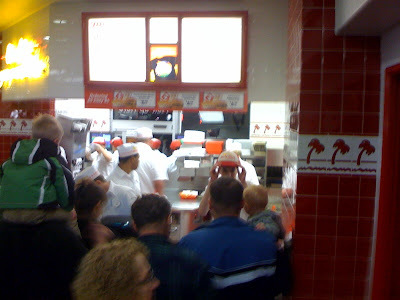 The first thing you will notice, is that, like all In-N-Out's, it's always busy. Both with customers, and with employees. I mean, seriously, how many people can you have back there at once? 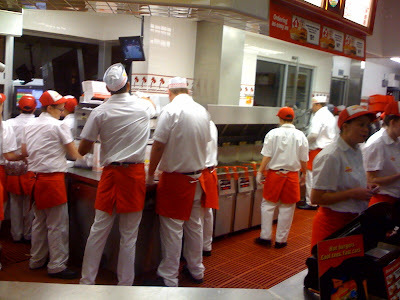 The other thing you will notice, is that ALL of the employees are really, really nice. The over-worked order caller (I just made that title up) even helped me carry our trays to our table. 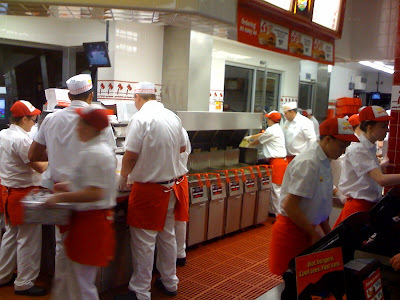 That is one reason there will never be an In-N-Out in Philly (sigh). While you are waiting, you can indulge in some fresh brewed, unsweetened, iced tea. Which I love. 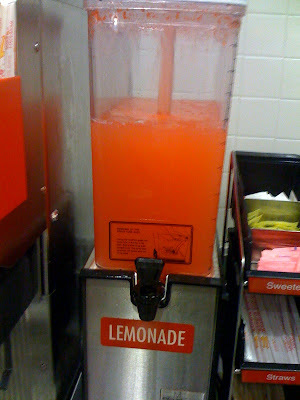 Also there is some magical pink lemonade in an old school drink dispenser, that is also quite delicious. Arnold Palmer's all around. On to the food. There is, of course, the "secret menu" which I don't understand, because it is on their website right under the regular menu. But I always partake. Once you call something "secret" I am all in. 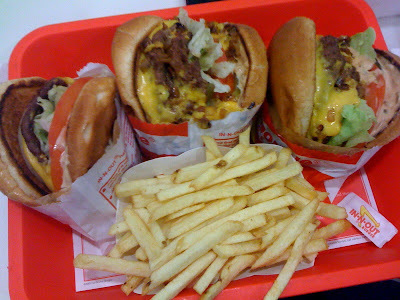 Pictured below is a double double "animal style". Double meat double cheese, and they hit the burger with some mustard (mustard grilled) before adding grilled onions pickles lettuce, tomato, and thousand island dressing. The burgers are awesome. Tasty, only slightly greasy, fresh, and delicious. However the difference between regular and "animal style" is not HUGE. 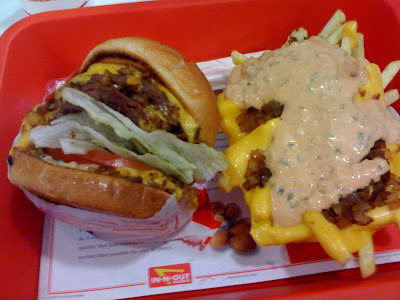 But the fries, animal style, are a different beast altogether. Take those grilled onions, welfare cheese (processed yellow American) and smother them all in thousand island. And I mean smother. These things are sooo bad for you, but if you want to whine about calories, why did you even come? They are also sooo delicious. You might end up eating them with a fork, or if you are like me, scooping up all of the messy goodness with thousand island stained fingers. Totally worth it. Regular fries, but why bother? 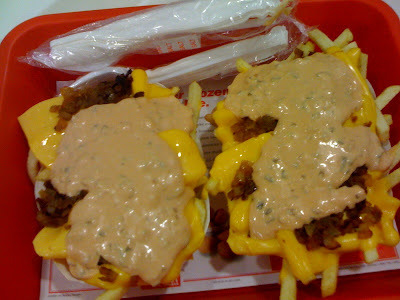 Double order of the "animal style" fries below. Heaven in a fry boat. More (food) posts coming soon. 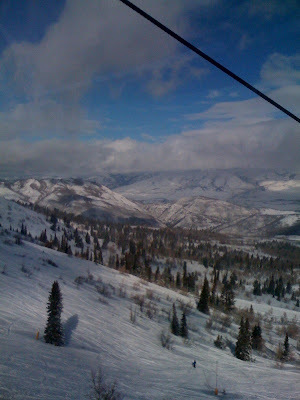 I have been slacking because I was on a snowboarding trip to Utah. 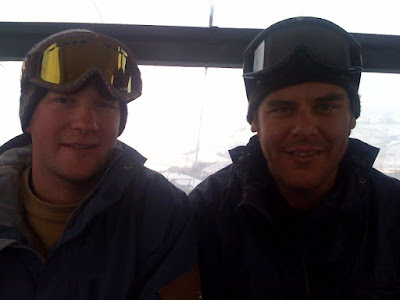 We got dumped on, and I rode some crazy stuff. 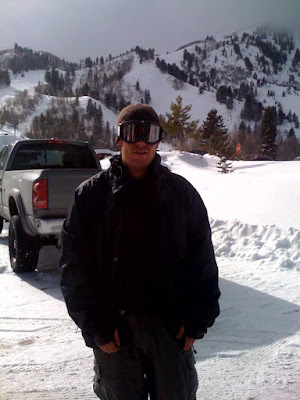 It was my first time back on a board since I left Salt Lake 4 years ago. It was amazing. 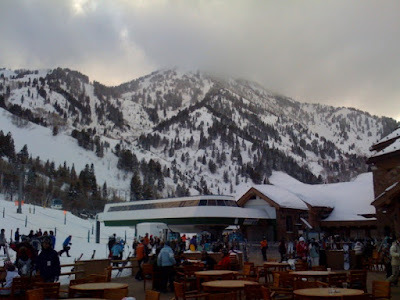 We hit Brighton, Snowbird, and Snowbasin. More food posts coming up, after I get my school work done. I really like the South Philly Taproom. It's a pretty cool beer drinking bar. I have been hearing and reading rave reviews about their burger these days, so I went to check it out. Although it was technically brunch, I ordered the regular burger because I wanted to see what all the fuss was about. I ordered it medium, but it came well, leaving it a big dry. Also their red onions took over the flavor of the burger. However, the bun was really a good burger holder. The secret sauce was too mustardy, which mixed with the onions to really over-power your taste buds. 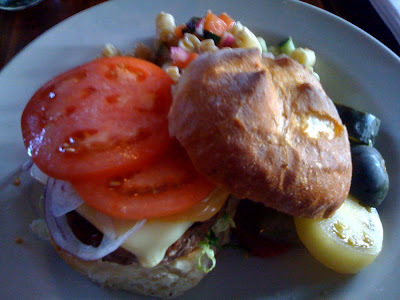 It did have promise, and it scored well on the local burger club meating, but it was a bit lacking for me. 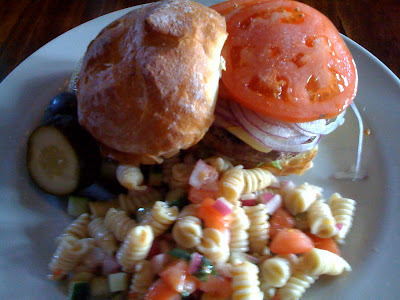 One thing I liked is that they salted the tomatoes on the burger with sea salt. This is an attention to detail that I really do appreciate. The fresh pickled vegetables were good, and it was a pretty good fresh pasta salad as well. But I just wasn't blown away, so the search continues. I was very excited when I heard there was a Cajun place coming to RTM. Although I was worried for them. Could it really be that I wouldn't have to drive to Delco any longer for good Cajun food. Well, the answer is yes and no. Yes you don't need to drive to Boothes Corner market for a Cajun food stand any longer, but you would be foolish not to (I only did because I was craving a Po'boy on a Sunday and Cajun Kate's, the holy grail of Cajun in the Philadelphia area, was not open. Reading Terminal Market has a surplus of good foodstands. And there are also a surplus of mediocre stands as well. Cue Beck's. I started with an order of Cajun Fries. 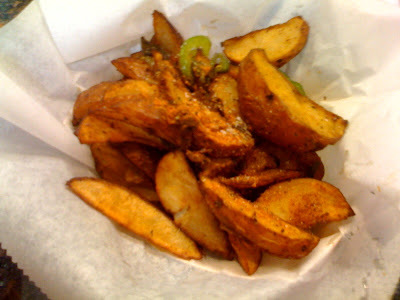 They are described as Louisiana spiced and served with jalapeno's, green peppers and onions. The were actually wedges, and sad at that. 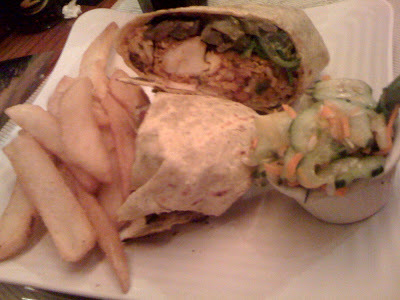 Even the small ones were not crispy, and the overly softened vegetables made no sense. It was a soggy boat of greasy, disappointment. I ate less than a third of them. I should have known from the start, when the woman working the counter was unable to discern the difference between diet and regular soda, I had to explain three times, eventually pulling out the menu to point to the creole mayo, when asking for extra on the side. Strike two. 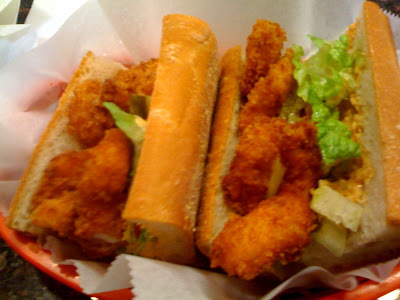 The shrimp Po'boy was okay. The shrimp were crispy, but the pickles were sliced too thin, and the tomato was chewy. I understand that tomatoes are generally gross right now, but why do people insist on serving something that is not good. Anyway, the Creole mayo was pretty solid. The one big issue I had with the sandwich was the bread. 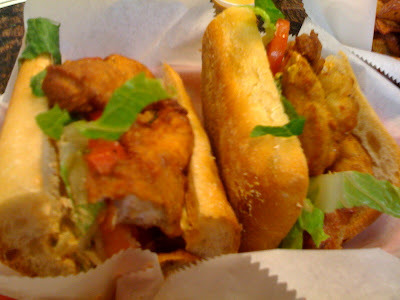 It would have been great on an Italian hoagie, but as for my Po'boy, I like them on a light and fluffy french roll. These things were pretty solid, and at times I used two hands to rip the bread off with my teeth. The shrimp were hitting the eject button at that point, and things were sliding all over the place. 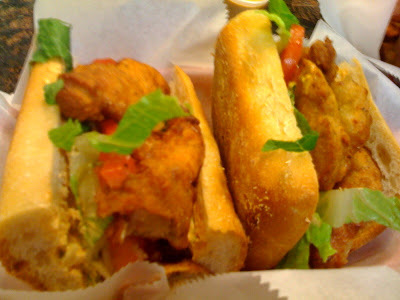 Now, the Catfish Po'boy. The ingredients were exactly the same as the shrimp, but that was one thing I just could not shake. The catfish was...fishy. Really fishy. I don't know why, but it was although it was handled with fishy hands after the deep frier. 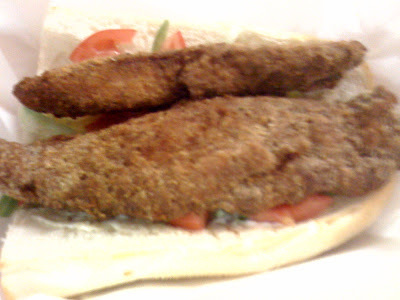 The breading was good, crispy and crunchy, but I just don't feel as though fried catfish should ever take that weird fishy flavor. It was even too overpowering for the Crystal hotsauce to cut through. Strike three. So...I had originally felt I would stop here for a quick Po'boy fix, but in retrospect, I would rather wait until Cajun Kate's is open on the weekends. There is literally no contest. (More catfish shots above and shrimp below). 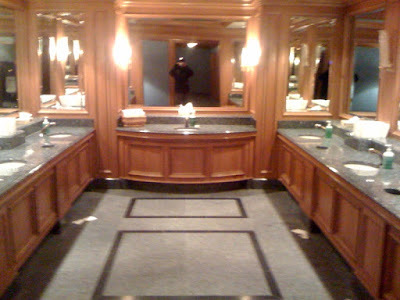 Ok, I am sorry to rain on everyone's parade, but I am just not that impressed with this place or Pho in general. 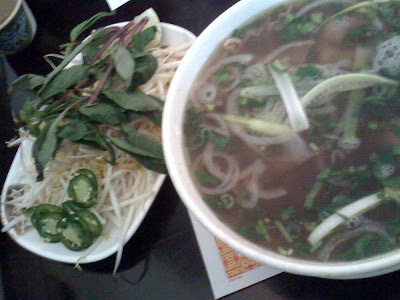 I have had it in the past and didn't really care for it, but I decided to go back to Nam Phuong last weekend. 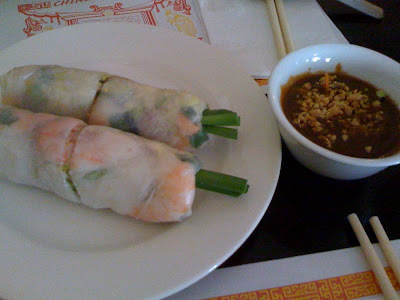 The summer roll was great, and I loved the peanut sauce. 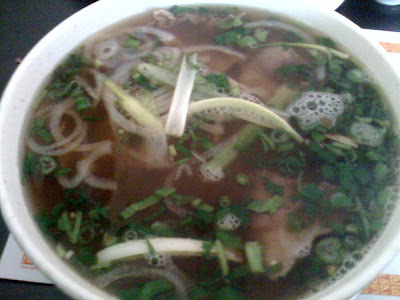 But my mission was to love Pho, and I just couldn't. I thought the flank steak would be a good bet. It came out looking like tripe, in huge sheets. It was pale, gray and rubbery. Meh. 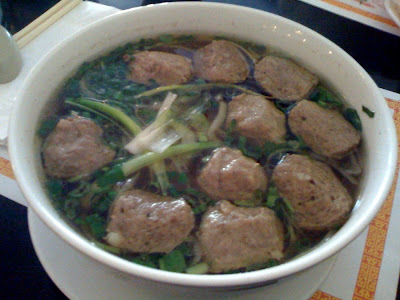 The broth was okay, but the star anise is so prevalent, that I found it sort of off-putting. 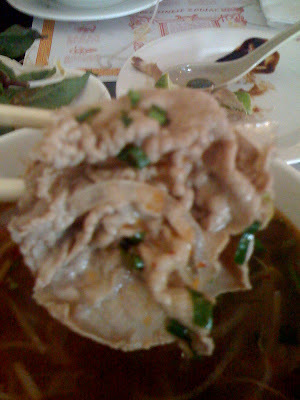 I could replicate the dish by adding some noodles and sprouts to beef broth that is too heavily seasoned with Chinese five spice, however I guess I would have to boil the meat to get it to that consistency. I know ALOT of people who love Pho, and Nam Phuong, but I have to say, give me the hand-drawn noodle house ANY time over Pho. I am quite an adventurous eater, but I am not going to be impressed with food simply because it is cheap and served in large portions. Here is a (slightly fuzzy) picture of the "flank steak". I think you can make out the strange color and texture. The back-up order, the meatballs were another story altogether. Meatballs are a pretty easy food to make. These things were absolutely disgusting. I hate to say it, but they were. To get an accurate picture of what these little tragedies were like, soak some Nerf balls in beef broth and serve. Seriously. I had one bite and spit it out. Sorry Nam Phuong, but I don't think we will be crossing paths in the near future, if I have anything to say about it. I am not really a fan of brunch. For one, I don't like drinking in the early afternoon, as that never leads to a productive day. Once in a while, a big greasy breakfast hits the spot, but I hate feeling bogged down and lazy (see point one). 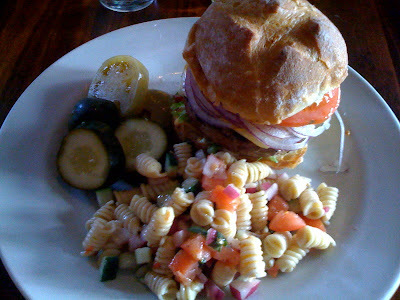 If I am going to eat something large and bad for me, I tend to favor the lunch options. But after an initial couple of fun night time experiences at El Camino, a good friend/Sunday bartender talked me into my second Brunch trip there again last weekend (not the drinking kind, but the greasy breakfast type). 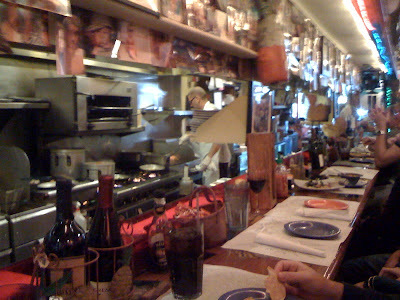 I don't really like the Piazza all that much, but I have BBQed there, and I have been to El Camino a handful of times. 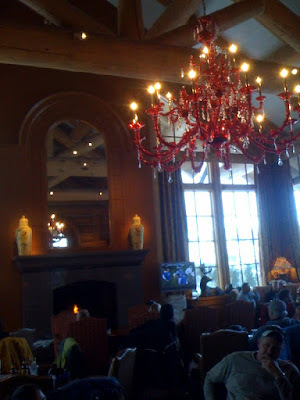 It is a great place to avoid the normal long waits for brunch around the city. And they serve a mean Tex-Mex (Yes, I also hate that phrase, but it is the only way to describe this food) brunch. The chips and salsa (not pictured) have a great flavor and there is some sort of spicy paprika salt powder on the chips that is a great treat. Also, they serve two kinds of salsa, one spicyish green tomatillo salsa, and what I believe is a lightly smoked pico de gallo for the other. Smoke is a big part of the menu here, and I approve. 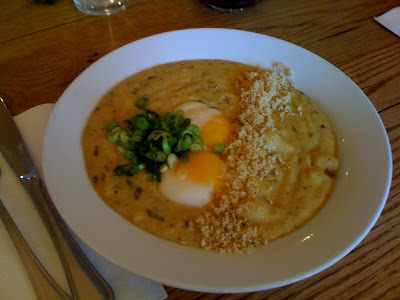 Above is the smoked Jalapeno grits and eggs. They were served with duck cracklings (those things that look like chopped peanuts) and sliced scallions on top, cojita cheese mixed in, and two soft cooked eggs peeking out. The grits were outstanding, smoky with a nice kick. I have recently become very fond of grits. The soft cooked eggs lent a rich, and creamy swirl once the yolk was broken, and really contributed the flavor and feeling of indulgence. The duck cracklings were sort of lost in the richness, but they gave a nice texture contrast to the rest of the dish. I would eat those grits anytime, and they were really the star of the dish, as they should be. Pictured above is the baked huevos racheros. Right off the bat, anything served in it's own cast iron skillet is going to have to try pretty hard not to please me. This is a great rendition of a staple Mexican breakfast I have had many times. 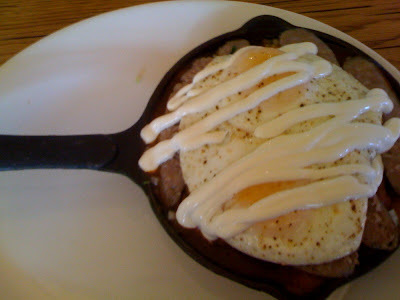 I got my eggs over easy, and they were accompanied by corn tortillas, refried beans, cilantro, onion ranchero sauce (awesome), chihuahua cheese and crema on top. Although I ordered Chorizo with it, it came with sausage. The situation was quickly rectified, and I now had 3 full sausage links split over the top, and a side of two chorizo patties. Hear that? It was my arteries clogging. With delight. The huevos are great, but like everything at El Camino, they are not for the faint of heart (literally, your cholesterol goes up looking at the food). But you are here for greasy breakfast food, and as such, you should just embrace the fact that you will undoubtedly be tasting this food until dinner (there will be no need for lunch or snacking, as the portions are ample, and hearty). 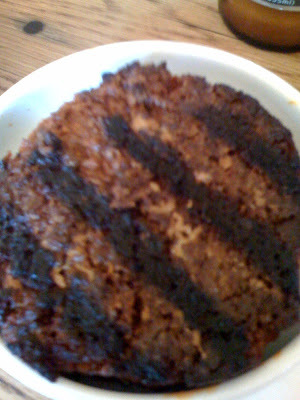 Below is my favorite thing on the menu, the house smoked chorizo patties. They are SO GOOD, spicy, smoky and deep in flavor I could eat these with every breakfast I have out, and it is really saying something if I prefer a breakfast meat to my esteemed friend, bacon. So check out El Camino, and if you are in a drinking mood, they have a great selection of tequila and pretty decent beer selection as well. Just don't plan on being hungry for the rest of the day. Is there a better way to pass the time before a flight then eating delicious food? I think not. Before I left for vacation, I checked in at the airport and then left and headed to Delco for my Cajun fix. Boy, was I glad I did. I have eaten at Cajun Kate's many times (I wrote about it before here), and I have always had outstanding food. This time was no exception. Don, the owner/chef is an awesome guy and LOVES his food. Which is exactly how I feel about his operation. Although it can sometimes be a bit frantic finding a place to sit (there are only about 8 stools) the people working there make you feel right at home, and they certainly make sure you get fed in a timely manner. My biggest problem is that I literally want to order everything on the menu. I started with the crawfish pie. I had never had it before, and I now know what I was missing. 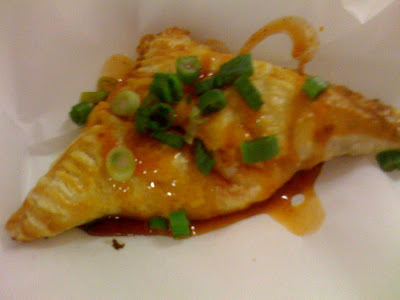 Flaky puff pastry dough, with tender chunks of crawfish inside, and a creole tomato glaze that I could eat with a spoon. Absolutely delicious. 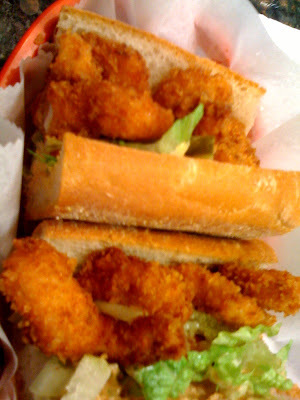 A half of a catfish po'boy, with extra sandwich spread was next. The catfish was crispy on the outside, tender a flaky on the inside. I love these Po'boys SO MUCH. Add a healthy dose of the crystal hot sauce supplied on the counter and you are in sandwich heaven. Last, but ceratinly not least, the star of the show. 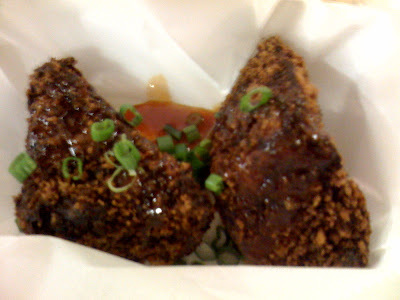 Deep fried Mac and Cheese wedges. These were filled with the weekly special fillings of tasso ham and crab meat. Also drizzled with that ridiculous delicious tomato glaze. That stuff should be mandatory on most anything that you eat. It's that good. Until next time (which won't be long) I will leave you with an old creole saying "Faut pas marre tayau aven saucisse" which translates to "Don't tie up the hound with a string of sausages". Sounds about fitting for my life. 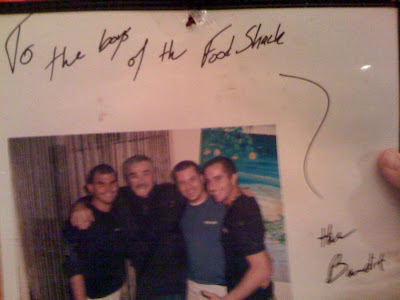 Ok so the Food Shack isn't in Philly, or it's surrounding area. But it's worth driving to Florida for (I flew). Although I ate at the Food Shack about five times in the week and a half I was there, I could only bring myself to take pictures on the last trip. Because if you sit at the bar, you get to watch them cook, and that is far more exciting than taking pictures of your food. Plus, I am usually so excited when my food arrives, that I am half-way through whatever I ordered, and that is no way to present a meal of this caliber. The Food Shack is one of (if not) my favorite places to eat lunch I have ever been. The bar seats allow you to talk to the chefs, and they will often give you samples of what they are preparing. 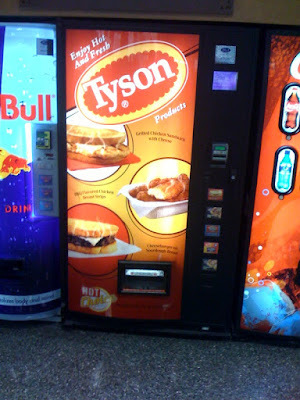 The best part, is that EVERYTHING they make is awesome. On a recent trip, I was given a bowl of coconut curry seafood and vegetables to taste in addition to my meal, which could have been a meal on it's own because the chef "made too much". Everything is fresh, island-style and cooked to order. I have never had a bad meal there, and some have been downright amazing. Below is the crab salsa. 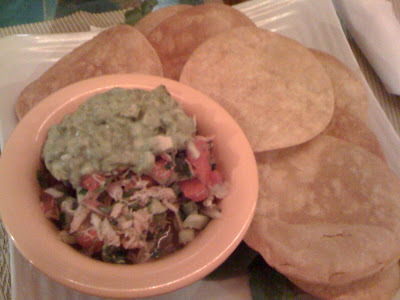 It was light, fresh, loaded with crab meat and citrus, and topped with incredible guacamole. The chips were whole fried small corn tortillas. It was a great way to start the meal. 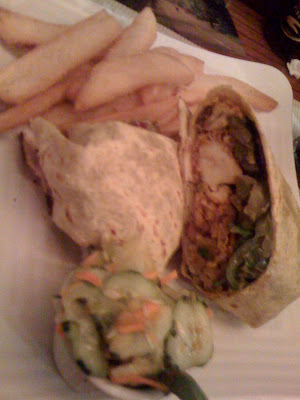 For lunch I got a blackened tilefish wrap. It was a special. Inside were caramelized peppers and onions, and some amazing red beans and rice. I could eat the rice and beans for the rest of my life. Chunks of smoky, salty ham were scattered throughout. It was an incredible enhancer to the charred fish. On the side, steak fries and island slaw. I mean even Jupiter's finest approves.